A well detailed small family garden in the city. This was a small walled garden in Edinburgh that had become overgrown and lost as a useable space for the property. With no access except through the house the detail of the garden had to be low maintenance. This property was being refurbished as a modern airy family home and a similar character was wanted in the outdoor spaces. 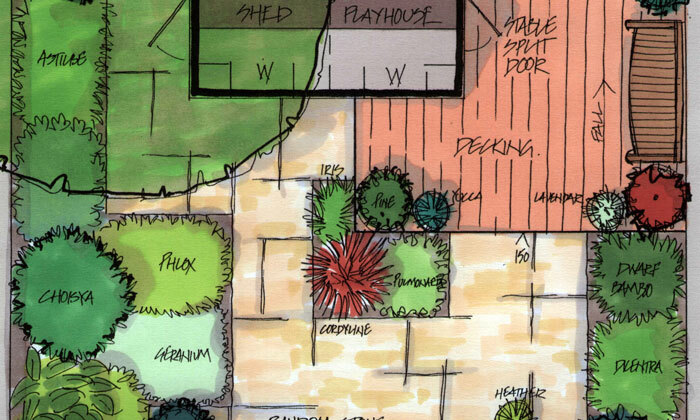 This was a whole property master plan for a front and back garden. I designed a simple, neat and attractive front garden that added privacy to front windows and was functional. I kept the priority of budget for the rear garden to create generous activity spaces in natural stone and timber to be in keeping with the architecture and new refurbishment work. The result was a good balance of hard and soft detailing to accommodate all the needs of a small family garden in the city.